The entrance gate is falling. It was not so some 12 years ago when the fiery human rights activist, Comrade Ola Oni, was effectively in charge. It was always hustling and bustling. But that is a sad history now. Welcome to No. 9, Odeku Close, Bodija, Ibadan, Oyo State. The area is popularly known as Favours. But the occupants of this particular house are far from being favoured. 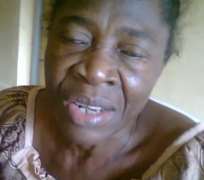 Mrs. Kehinde Ola-Oni, the blind widow of the rights fighter, is leaving in abject poverty with her children in this house. Pity! Her husband passed away almost 12 years ago on December 22, 1999. Neglect is written all over in the family. That abode has seen better days. It now wears aged paints. The siting room that used to bubble is in shambles. It has practically passed away with the comrade. It is 'furnished' with a tattered old, and dirty rug; a plastic table and chairs. Comrade Ola Oni died on December 22, 1999, almost 12 years ago at the University College Hospital (UCH), Ibadan. He was an extremely busy human rights activist. He died after returning from a meeting of the Alliance for Democracy (AD) in Lagos. He suddenly fell ill the very day he came back from Lagos. Under strange circumstances he passed away unexpectedly. It was painful to see him in that condition. I thank God, prayers have sustained me these past 12 years. Many of Comrade's colleagues have turned their backs on us. The people who used to come here when Comrade was alive have deserted us. They were behaving as if they never knew this place. They were the ones that kept Comrade busy over them when he was alive. He served them and lived for them. They were the ones that actually worried him. Now, they are nowhere to be found. it is a big surprise. I will advise women and men to handle their families very well while they are alive. They should be strong and hold their families tight. I thank God for making me to meet my good husband who was so supportive. That has given me boldness. They called him the hero of the masses. After his death, only few friends have come to this house. Some youths are writing his biography to be launched soon. However, some of Comrade's colleagues use to check us up. My children have no jobs. Two of them are graduates, they are managing with some NGOs. Government should create environment for job opportunities. I am using this opportunity to thank some philantropists and activists. Few of them come here and help. People like Moshood Erubami, Comrade Sanda and Prof. Akin Ojo, they always come and advise the children. Governor Rauf Aregbesola (of Osun State) sent emissaries here. He replaced some of the louvres and bought a generating plant for us. The doctor told me that because of my bad eyes, I should not leave in a dark environment. I did not know how he got to know, and he sent a generating set. There was a time I had a severe backache. I am not used to sitting down for a long time as an activist. But since I became blind, I cannot go anywhere unaided. It was then I had the backache, and my foam had become old. Aregbesola bought a new one for me. Ola Oni, I won't say he is late because he left many indelible marks. Some of his colleagues are still in contact with the family, trying to help. Yes, he fulfilled some of his dreams. He was always willing to assist the masses and people in power, especially the executives of AD. He believed in democracy, preached it and justice all his life. He was always there for the youths, students, the labour, civil societies and the down-trodden. And they assisted greatly during his burial. I rely on God. I could not continue the treatment at UCH because of money. I had paid through my nose. I have stopped going there, I cannot afford it. For two, three years now, I have not been there, I have no money to pay. I am now at home waiting for miracle. I have the belief I will see again. I believe the eyes have not been treated as they should be. That is why I have not regained my sight. I have the belief through Jesus Christ that I will still see. In a very short time, people will celebrate with us. The incident happened on March 19, 2001 when the police threw teargas at a close range to my eyes. It happened here right at the gate of our house, barely one and a half years after the death of Ola Oni. Let me leave it at that. Comrade Ola Oni was not only my husband, he was also my father, helper and supporter. There is no other husband like my husband. If people use to marry in heaven, I will still marry him. He was a good father, an organiser, friendly to the people. He had ample time for the children. The time he died was the period he supposed to take good care of the children. His death was a blow in my life. I am married to Jesus Christ now. It is only Jesus who can console me. He was 66 years old when he died, 12 years ago, I am 68 years now. I retired from the civil service in 1977. After the creation of Ondo State in 1976, my service was transferred from the then Western State. Later, they exempted women whose husbands are in federal institutions from the transfer. That too was reversed in 1977 and I was back in Ondo State. Late Adewole Adesida was the Permanent Secretary, Ministry of Agriculture, where I was transferred. There was no accommodation in Akure both office and residential. I was then a nursing mother and my aged mother was staying with us in Ibadan. When Adesida saw my problem, he assisted in arranging my retirement in 1977. Since then, I have been pursuing my retirement benefit. All my documents were sent to Akure from Ibadan. They had already prepared my entitlement and I saw it. Three times they did that because officers handling it had been transferred several times. I have been on it since 1977. The last time I was there was 2008 because of my eyes. I have filled forms several times and submitted documents many times over. They claimed they had not seen my last promotion letter sent from Ibadan I cannot go there without being aided. I would pay for myself and the aide. It consumes money. It has been pretty difficult. I want to appeal to Governor Segun Mimiko of Ondo State to assist me and my family. I have not seen or met him, but he should assist in paying my entitlements. I have documents including the gazette to back my claims. I am also calling on philantropists to help me to live a decent life. If my eyes are repaired, I can still be useful. We have SEAP, lending money to widows. A group of widows meets here every Thursday. There is also SWIM, a ministry for widows. SWIM brought SEAP here. It is co-ordinated by Bishop Eric Erisele. If Ola Oni's children are fixed up, the family will be settled. If they have good jobs, it will be my greatest happiness. It will make things easy for the family. Widows should be given jobs so that they can help other widows. Widows can still be useful to the society in many areas. They should not be made helpless and hopeless. If somebody is blind or crippled, does it mean the person has lost his brain, his senses? Or he cannot be useful again? God can use such blind or crippled to transform Nigeria. When you develop a woman, you have developed a family, and invariably a nation. I have connection with various NGOs and rights organisations both in and outside Nigeria. I was twice the coordinator of Action Women in Nigeria (AWIN) in Oyo State. I was also its national membership secretary. We were networking with other NGOs like the National Council of Women Societies (NCWS), SEDA etc. We used to meet here, 9, Odeku Close, Bodija, Ibadan, Comrade Ola Oni's house. I had worked closely together with CASAD, founded by the late Prof. Oshuntokun on Women Affairs. So also USAID, United States Information Service (USIS). They all funded AWIN on women empowerment.